The purpose of the study was to examine the acute effects of different dynamic exercise interventions on hamstring muscle performance. Thirty-six young men with poor hamstring flexibility were randomly assigned to three intervention groups: jogging combined with dynamic open kinetic chain stretching (DS), jogging combined with dynamic closed kinetic chain stretching (lunge with eccentric hamstring windmills, LEC), and jogging only (CON) groups. Hamstring flexibility, muscle stiffness (area under the curve, AUC), joint position sense (JPS), maximal eccentric strength (ECC), and angle of peak torque (APT) were recorded before and immediately after the exercise interventions. 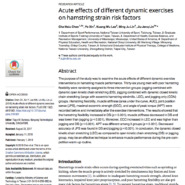 The results showed that the hamstring flexibility increased in DS (p < 0.001); muscle stiffness decreased in DS and was lower than jogging (p < 0.001). Moreover, ECC increased in LEC and was higher than jogging and DS (p < 0.001). APT was different among 3 groups (p < 0.001). Decreased accuracy of JPS was found in DS and jogging (p < 0.001). In conclusion, the dynamic closed kinetic chain stretching (LEC) as compared to open kinetic chain stretching (DS) or jogging group, may be an effective technique to enhance muscle performance during the pre-competition warm-up routine.